Container Gardening begins with Garden Crossings. Our new online Combo Design Tool lets gardeners design and order custom-created hanging baskets online. Planted exclusively with Proven Winners plants, these gorgeous baskets from Garden Crossings, an online nursery based in Zeeland, Michigan, bring hard-to-find plants to gardeners around the United States with just a click of a mouse. Everyone has their own unique tastes when it comes to decorating their homes, why should buying plants be any different? I wanted to give our customers the option to create their own or purchase a pre-designed combo. Garden Crossings, a retail and mail-order nursery in Zeeland, Michigan, specializing in Proven Winners®, is proud to announce a new online garden tool that helps container gardening customers create beautiful hanging baskets and container gardens with the click of a mouse. 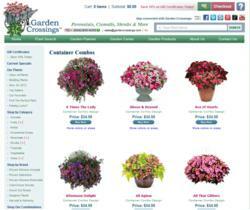 Unlike other online design tools, once someone is finished designing their unique hanging baskets, they can order them straight from the Garden Crossings retail website. The custom 12-inch baskets are planted and grown at the nursery for four weeks so they’re ready to display once they reach customer’s doorsteps. The Combo Design Tool is based on the “thrillers,” “spillers,” and “fillers,” concept, and helps guide customers through plant selections categorized as one of the three. Customers browse photos of each plant and select not only the plants, but also where the plants are planted in the container. Garden Crossings recommends one thriller and two each of the spillers and fillers for the containers. Planting areas in the containers are marked A, B, C, D, and E, and customers indicate where in the container they’d like each plant. A video on the website explains how to use the design tool so that customers can feel confident while building their creations. To view the Combo Design Tool, please visit the website: http://www.gardencrossings.com/Combo-Designer. In addition to creating beautiful gardens with the Combo Design Tool, customers can also order gorgeous combos created and tested by Garden Crossings. These “one and done” combos take the guesswork out of gardening by letting customers select—with one click—colorful hanging baskets with proven track records. Pre-designed combos are available for viewing here: http://www.gardencrossings.com/Container-Combinations. Started in 2002 by Rod and Heidi Grasman, Garden Crossings has grown into the premier online retail and wholesale garden center and nursery direct-shipping highest-quality annuals, perennials, shrubs, fruits, herbs, and vines. Garden Crossings makes new selections and introductions available to the consumer as soon as they’re available, giving gardening consumers the chance to enjoy interesting and innovative plants several years before they are widely available in brick-and-mortar stores. Based in Zeeland, Michigan, Garden Crossings has 40,000 square feet of growing space and 15,000 of retail shopping space. They are one of the top 30 garden centers in the “Watchdog 30” on Dave’s Garden, out of over 7,000 listings. This is a combination of attention to detail, superior plant quality, tested shipping practices, and hands-on customer service. 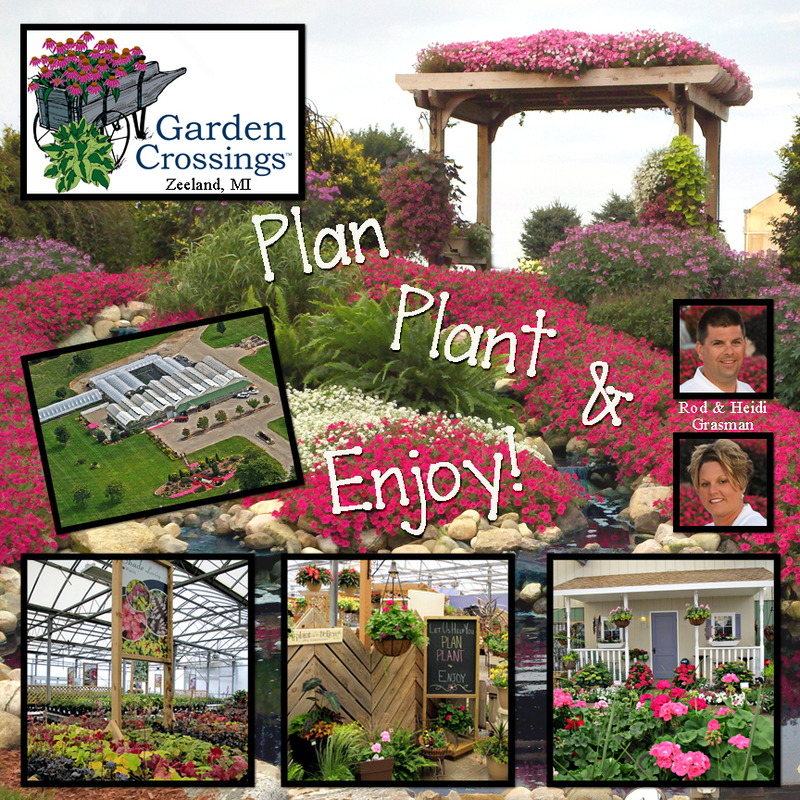 For more information about Garden Crossings, please contact Rod or Heidi Grasman at 616-875-6355 or send an email to sales(at)gardencrossings(dot)com.